The austrian climber will receive the Award of The Walk On Project Foundation (WOP) to the defense and transmission of social values of mountaineering, receiving at the same time the recognition to his career. 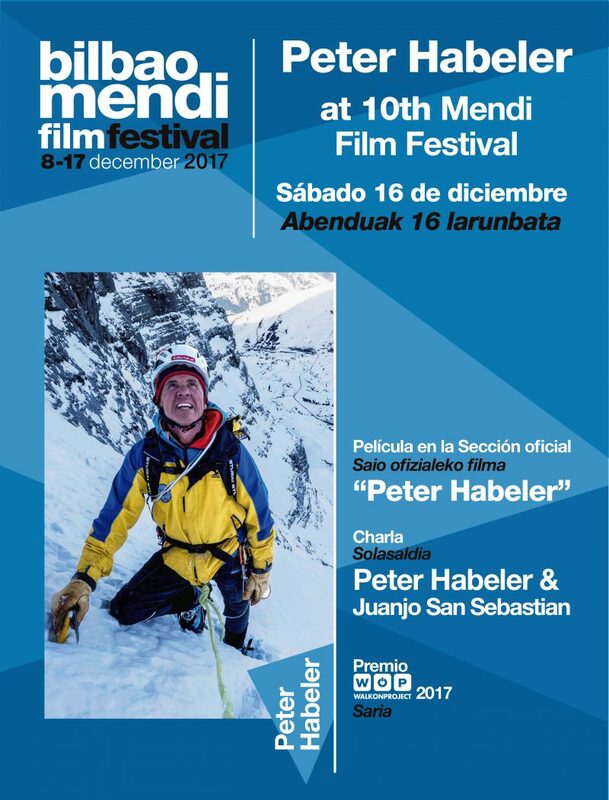 This event will be held in a special session of the Mendi Film Festival on Saturday, December 16, at 19.30 h, Sala BBK. In addition, the session will be screened Peter Habeler a Timeline Productions film into the Official Section of BMFF. Peter Habeler is the man who opened the doors of modern mountaineering climbing with Reinhold Messner. They were the first to reach the Summit of Everest (8 848 m) without the aid of artificial oxygen, in 1978, when everybody believed it was impossible. Messner and Habeler were the first to demonstrate that it was possible. They were high level mountaineers, which began climbing together in 1969, and that already in 1975 completed the first ascent in alpine style to an eight-thousander, in the Gasherbrum I (8 068 m). Among Habeler’s main achievements we must also highlight other three eight-thousanders, Kangchenjunga, Nanga Parbat and Cho Oyu; he opened new routes in the Yerupajá (6 634 m) in the Andes; and he was one of the first europeans to climb on the big walls of Yosemite (via Salathé Wall of El Capitan, with Doug Scott, in 1970). The film Peter Habeler shows one of the best climbers of history, who wants to celebrate his 75th birthday by climbing, once again, the north face of the Eiger in the company of one of its “successor”, David Lama, one of the best current mountaineers who learned to climb with Habeler when he was still a kid. It is a film which depicts the honoree WOP at 2017, a mountaineer who opened the doors of the modern climbing with Reinhold Messner. In 1975 they completed the first ascent in alpine style to an eight-thousander in the Gasherbrum I (8 068 m), and they were the first to reach the summit of Mt Everest (8 848 m) without the aid of artificial oxygen, in 1978. The Walk On Project Award recognizes the defense and the transmission of social values of mountaineering. Values such as overcoming, effort and teamwork; commitment and optimism as an engine of change. The WOP Foundation has considered that the career of Peter Habeler is worthy of receiving this award, reflecting these values with his work. In these years WOP has forged a road without rest, step by step, to explain its mission in the fight against the neurodegenerative diseases. The The Walk On Project Award is part of those social values associated with the sport. In fact, WOP is present in the world of mountaineering with the WOPEAK project, featuring Alberto Iñurrategi, Juan Vallejo and Mikel Zabalza. 2016: Sir Chris Bonington. MendiTV video. 2015: Josep Manuel Anglada. MendiTV video. 2014: Drawn by Jeremy Collins. MendTV video.